WILDFIRES: Fire hazard ratings have reduced in the Rockies. Rain has improved the air quality somewhat but smoke and haze may be present in valleys due to forest fires burning near the GDT. SECTION A TRAIL CLOSURE: Due to the Boundary wildfire, the GDT is closed from the International Boundary (a1) to Bertha Bay campground. SECTION A RE-OPENED: The GDT has re-opened from Sage Pass (a17) to Castle Mountain Resort (a30). SECTION C TRAIL RE-OPENED: The GDT has re-opened from Ball Pass (c22) to Tumbling Pass (c30). CAMPFIRE BANS: Campfire bans are in effect for all portions of the GDT in BC. Fire Advisories are in effect for Waterton Lakes, Banff, Kootenay, Yoho and Jasper National Parks where campfires are only allowed in metal fire pits or boxes provided by Parks Canada. No random fires are allowed in these parks. BEARS: It’s berry season! Berry bushes border trails, roads and campgrounds on the GDT, and black and grizzly bears are feeding on berries right now. Be bear aware on the trails this summer: be alert, make noise and carry bear spray. BANFF NATIONAL PARK and PETER LOUGHEED PROVINCIAL PARK: A defensive grizzly bear feeding on a carcass in the Burstall Pass area was involved in a contact encounter causing human injury. Extra caution is recommended when travelling in this area. Burstall Pass access trail is closed. KAKWA PROVINCIAL PARK: August 28 – An animal carcass was found on the Kakwa Pass Trail at 53.959141, -120.137961. Hikers should avoid this area and stay north near this location when hiking through. Make noise and carry bear spray along the trail. Due to last year’s Kenow wildfire and the existing Boundary wildfire, some trails and backcountry campgrounds in Waterton Lakes National Park and Akamina Kishinena Provincial Park are closed. The GDT is closed from the International Boundary (a1) to Sage Pass (a17). Trail 7 near Jasper is closed to hikers south of the junction with Trail 4g and north of the junction with Trail 7a due to a grizzly bear attack in the area. Detour by taking Trail 4d to Edith Lake from where you can take several different trails (4, 4a, 4d, 7b) to reach Old Fort Point trailhead. Equestrians can still use Trail 7 but are not to dismount. Trail conditions are generally good but expect some wet and muddy sections during periods of rain. Warm weather means rapid melt during the day resulting in high water levels and potentially dangerous creek crossings, so attempt to ford larger creeks early in the day when water levels are lowest. and intersecting with the GDT again at 49.957641N, 114.658199W, just below Tornado Saddle. A windstorm blew through Yoho National Park in July 2017 resulting in many blown down trees. The Ottertail Trail was cleared in August 2018, but there may still be some debris on the trail near Goodsir Pass but these are fairly easy to get around. The first kilometre of the Amiskwi Trail was cleared in August 2018, but the rest of the Amiskwi Trail is in poor shape much of the way to Amiskwi Pass. Expect brushy, overgrown conditions, poor or non-existent trail requiring some route-finding, and wet fords of the Amiskwi River. 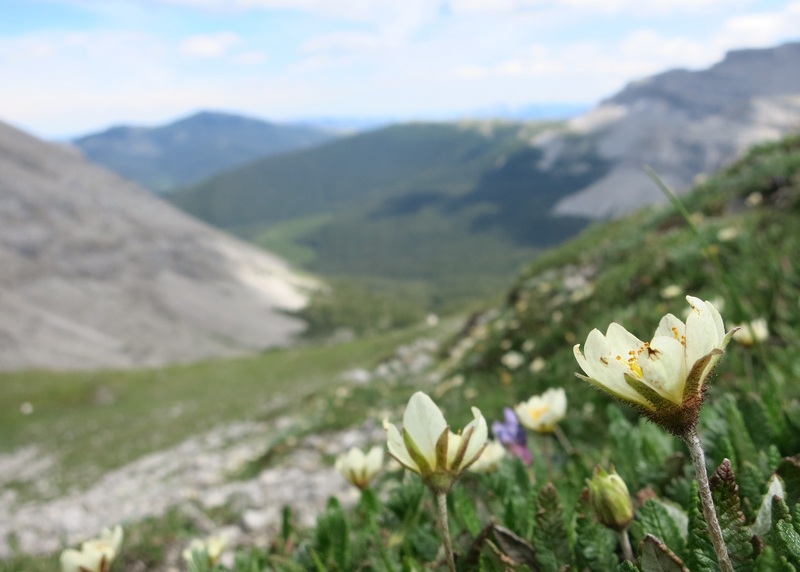 The Maligne Pass trail from Pobokton Creek (e20) to Trapper Creek (e24) is no longer being maintained by Parks Canada so expect deteriorating and overgrown trail conditions; long pants are recommended. The Maligne River bridge has been removed but the river can be easily forded in normal summer conditions (knee deep in mid-summer). Most other bridges are still in place. The Six Passes Route is a cross-country alternative to the overgrown trail for hikers with route-finding experience. Due to wildfire and smoke in the area, Highway 93 may be closed intermittently between Castle Junction and Radium.